You never forget your first white Christmas… Not when it looks like this. Warm breezes drifting in off the sea, the sun setting just off to the right, pale powder pocked solely with bird tracks stretching along the shore as far as the eye can see. This is Pine Cay, the private-island paradise situated just a quick boat ride from Provo in the Turks and Caicos Islands. My first and so far only visit here a few years ago still sticks out in my mind in large part due to the incredible beach here. You’re reading Photo Of The Day: Quintessential Caribbean White Christmas from Uncommon Caribbean – The Insider’s Caribbean Travel Blog. If you’ve enjoyed this post, be sure to follow Uncommon Caribbean on Facebook, Twitter, and Google+. A dash or two of cinnamon makes many Holiday Season treats all the more sweet, but it’s the sunny/salty seasoning of Cinnamon Bay, St. John that we’d always prefer for our Christmas and New Year’s celebrations. More on this special place, and ways in which you can wake up to this view despite the fact that there are no hotels or resorts on Cinnamon Bay, here. *Photo credit: Flickr user, Dani. You’re reading Photo Of The Day: Sweet Cinnamon Bay, St. John from Uncommon Caribbean – The Insider’s Caribbean Travel Blog. If you’ve enjoyed this post, be sure to follow Uncommon Caribbean on Facebook, Twitter, and Google+. We don’t spend a lot of time telling you where not to go in the Caribbean. Positive is how we live, you know? 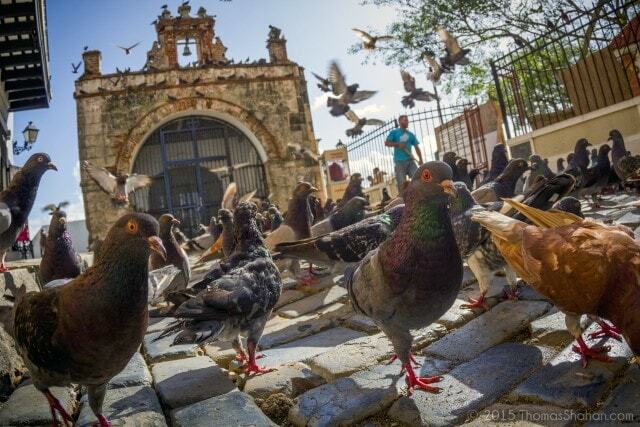 If you’re like me, though, and aren’t all that keen on getting up close and personal with birds, then you may not like la Plaza de las Palomas. Located right next to Capilla del Cristo Chapel, the tiny park provides a relaxing respite from the ancient city’s bustling streets; plenty of shade, comfy benches, and a fantastic view of San Juan Harbor all combining to create a magically peaceful setting. Except (for me), of course, for the pigeons. LOTS and LOTS of them! *Photo credit: Flickr user Thomas Shahan. You’re reading Photo Of The Day: Plaza De Las Palomas, Puerto Rico from Uncommon Caribbean – The Insider’s Caribbean Travel Blog. If you’ve enjoyed this post, be sure to follow Uncommon Caribbean on Facebook, Twitter, and Google+.